The mashup: Haute New York dumpling cafe Mimi Cheng’s had already won us over with their smores holiday dumplings, but they’re brightening the dark days of January with a new special: brunch dumplings. Available on weekends only, they’re filled with free-range scrambled eggs, maple breakfast sausage, cheddar cheese, and sautéed onion, and served with Sir Kensington’s ketchup for dipping. Staying power: High. Although this special will disappear from Mimi Cheng’s next month (cue sad trombone), it’s surely going to inspire similar items at other restaurants. We’re kind of surprised it didn’t exist already. The mashup: Freshness Burger is a Japanese burger chain that’s already on our food bucket lists, by virtue of the fact that they have a gyoza burger on their menu. 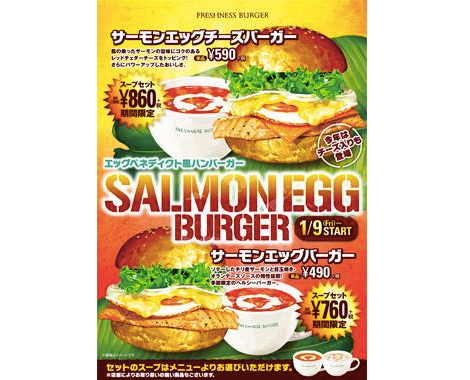 Now the chain is planning to introduce a breakfast burger with salmon, egg, lettuce, onion, and hollandaise sauce, that’s also available as a cheeseburger. 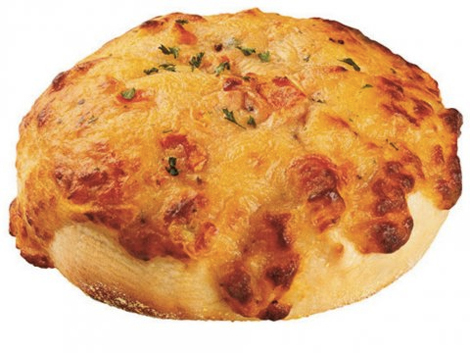 The mashup: Most people agree that a bagel covered in tomato sauce and cheese is called a pizza bagel. But Dunkin Donuts isn’t most people. The chain is offering its Tomato Mozzarella Supreme bagel in select markets right now, along with another new item: chocolate croissants.